My first group ride was a Boston Critical Mass in May 2007. 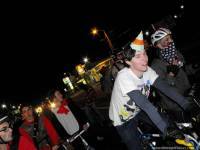 I first heard of the Midnight Ridazz just before moving to LA for a summer semester in 2008. I saw a news article on the Crimanimalz 101 Freeway Ride, so I found their website and sent an e-mail asking about what its like to ride in LA. They told me about Midnight Ridazz, so I decided to bring my bike to LA. My first rides in LA were in May 2008. LACM followed the next night by Cruzz With Us #19 (Tie A Stuffed Animal on Yo Back). Summer 2008 was the best summer of my life, it was hard moving back to Boston. The Passage of a Few People Through A Rather Brief Moment In Time. I moved permanently to LA in September of 2009 and this was one of the first rides I attended. I think it encapsulates everything MR stands for. Nathan and Sean always provide a great route, though its gotten me terribly addicted to midnight donuts. Also, I try to make it to the 2nd Friday rides and the RWNN when I don't have some obligation ruining my weekend. Comebacks? I'm too new to have nostalgia. Don't ride brakeless, or if you do, don't get drunk. Only one or two shortish mid-ride stops, not near a liquor store and make sure as many people know where those stops are in case of getting lost or mechanical failure. Some rides do that, but I'd like to see more of that. Well, The Passage is small and I love it, but nothing beats the rush you get from riding in a sea of Ridazz ten blocks deep. The Best: My first CRANK Mob, in June 2008. The energy level was through the roof, and I had no idea what to expect; so much dancing and bike jousting. In fact, every ride I went on during Summer 2008 was the bee's knees. The Worst: Not many bad moments, actually. I've been lucky. Seeing movies, maybe? College parties in Boston? Mostly though, I rode my bike and took photos. The best thing is that more people consider biking as something fun. The worst is that some drivers have a new target to displace their inferiority complexes/self-hatred onto. I can't do that. Everyone is so unique and brings something special to each ride. The wish they could ride with us. I wouldn't have moved to LA if it wasn't for MR.